Backing up your car safely just got a whole lot easier. 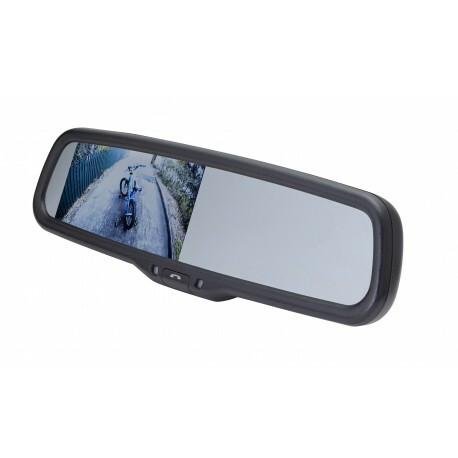 This sleek universal replacement rearview mirror with 4.3" monitor, replaces your old mirror with a fully integrated LCD monitor, pairing perfectly with any of EchoMaster’s many blind spot camera and back-up camera options. Dual video inputs mean you can use the monitor for both front and rear view cameras, giving you unprecedented visual information for full awareness of your surroundings and safe driving. Displaying feeds from your vehicle cameras isn’t the only thing the MM-4320-BT can do. It also comes with a Bluetooth-capable speaker, letting you communicate safely via your smartphone. The caller ID display is handy when you’re receiving a call while driving, and LED reading and map lights give you some extra visibility in the dark.